Since 1951, Zyliss has been one of the leading specialist brands in kitchen utensil design. The first Zyliss product launched by the founder Karl Zysset was a garlic press, which has been successful all over the world! The catalogue has since expanded with a wide range of around 150 ingenious, functional and ergonomic products that are easy to use, easy to clean and easy to store, so that cooking is always a pleasure. Rooted in its Swiss heritage, the quest for high quality products is at the heart of the Zyliss product development process. 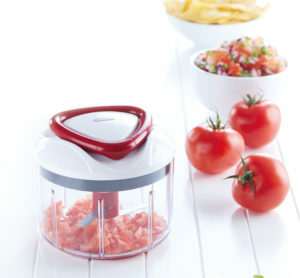 Zyliss utensils are designed to make cooking fun. You will appreciate their functionality and the little technical details that make them so intuitive and efficient to use. They are also attractively designed, with a soft square handle and elegant, plain colours matching any style of kitchen.